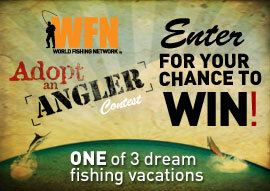 WFN: World Fishing Network wants to Adopt an Angler! Are you having problems catching the big one? You’re in luck! WFN wants to send you to an ultimate fishing destination hotspot where you will be able to improve your fishing technique spoiled in luxury! Submit your video, essay, or photo with essay telling us why you need to be adopted. All entries will be voted on by the public, so get creative and remember to promote your entry to get more votes. One of the top 10 vote getters will be awarded the grand prize by a panel of WFN celebrity judges who will pick the lucky winner. Start preparing your entry now and have fun! You could be on a fishing trip of a lifetime sooner than you think! Contest closes July 31st, 2009.